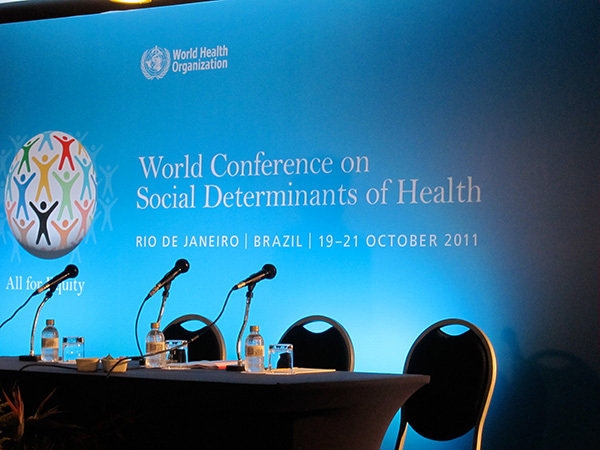 WHO convened a global conference on 19-21 October 2011 in Rio de Janeiro, Brazil, to build support for the implementation of action on social determinants of health. The conference (official website) brought together over 1000 participants representing more than 125 Member States and a diverse group of stakeholders. 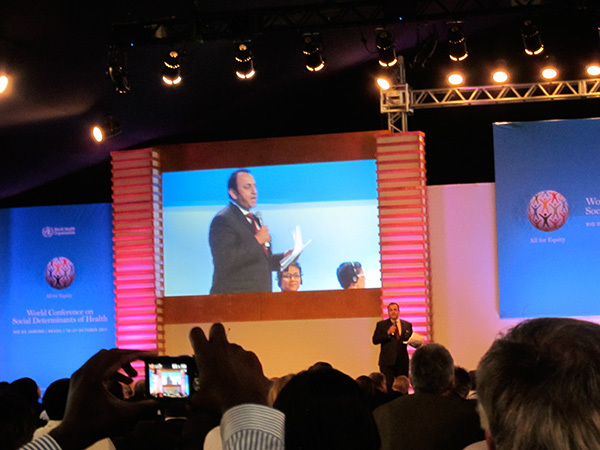 Fortunately, on behalf of FDI, I had the opportunity to intervene in two sessions, “Making policy coherent at national level”, regarding the necessity on all health policies to strengthen the social capital of communities, and “Changing the role of public health”, introducing the World Health Professionals Alliance Noncommunicable Diseases toolkit. The event was attended among others by Michel Temer, vice president of Brazil and Dr Margaret Chan, WHO director-general. 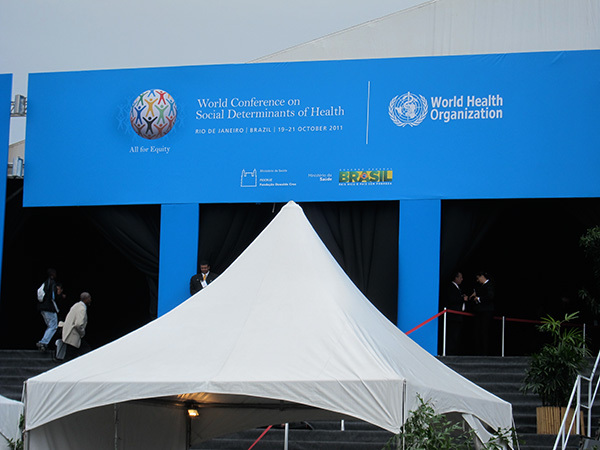 On 21 October, 2011 participating Member States adopted the Rio Political Declaration on Social Determinants of Health. 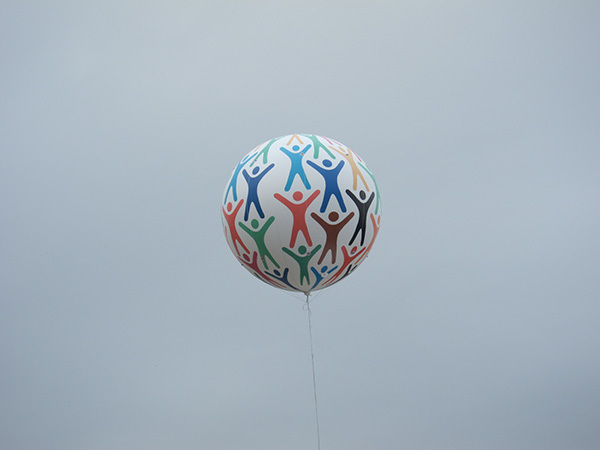 Now it’s time for all to work together on its implementation! Gateway of the “Forte de Copacabana”, where the meetings took place. 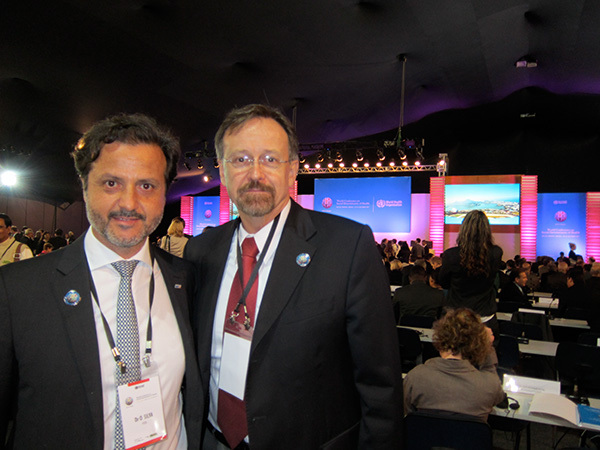 With José Gomes do Amaral, president-elect of the World Medical Association. 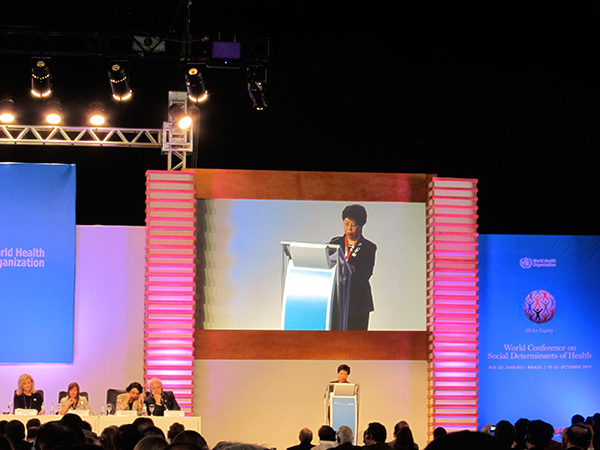 Dr. Margaret Chan, World Health Organization (WHO) director-general, addressing to the Assembly. 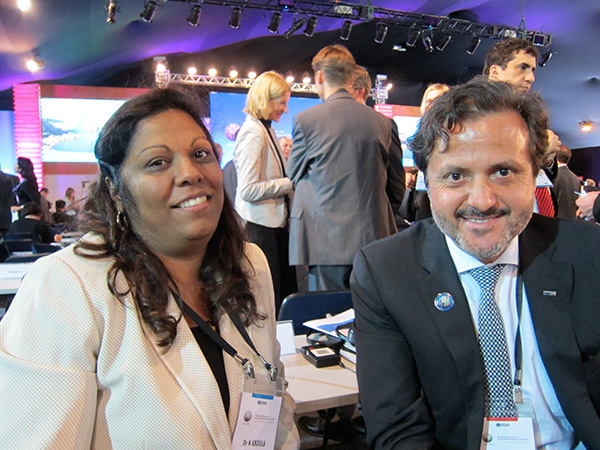 With Dr. Nazira Vali Abdula, vice-minister of Health from the Republic of Mozambique. 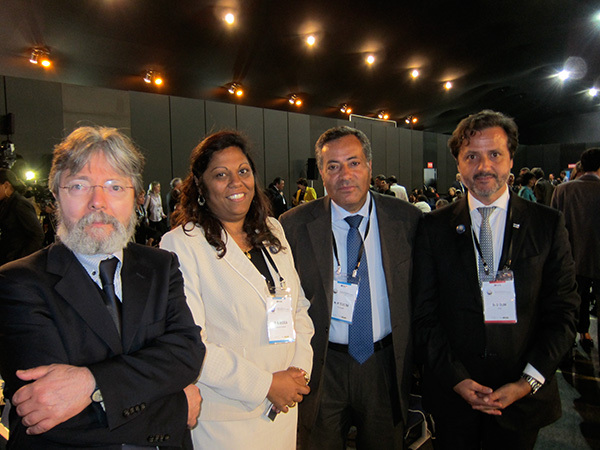 From left to right, with the Portuguese director-general of Health, Dr. Francisco George, the vice-minister of Health from Mozambique, the secretary of state for Health, Dr. Manuel Teixeira, and myself. Day two, overview of social determinants of health, previous day and today’s events, by the BBC World journalist Zeinab Badawi. On that same morning, I assisted to the session theme “Making policy coherent at national level”. 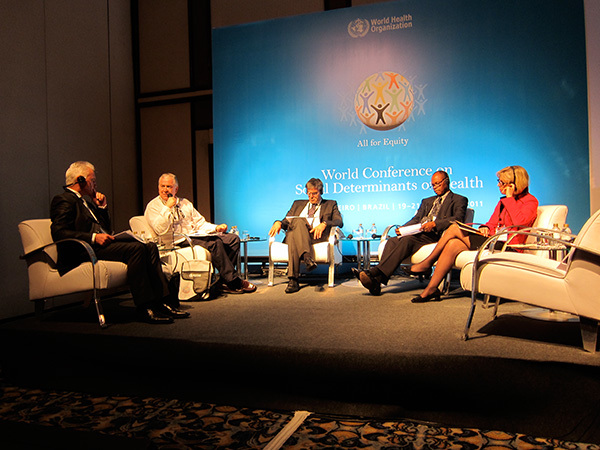 From left to right, Don Matherson (Massey University), Jorge Enrique Venegas (minister of Public Health of Uruguay), Dorijan Marušič (minister of Health of Slovenia), Robert Joseph Mettle-Nunoo (deputy minister of Health of Ghana) and Anne-Grete Strøm-Erichsen (minister of Health and Care Services of Norway). In this session, I had addressed an intervention on behalf of FDI regarding the necessity on all health policies to strengthen the social capital of communities. 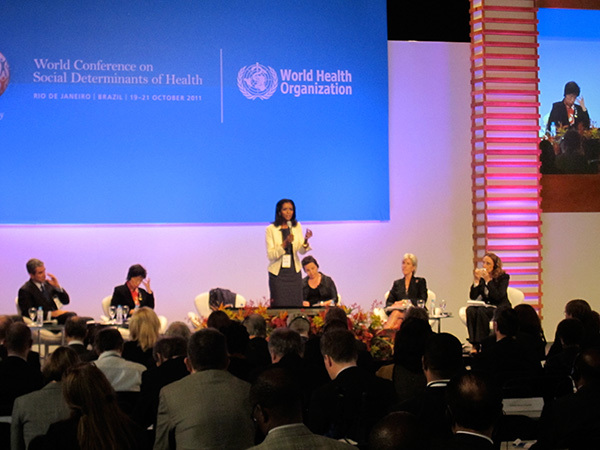 On the afternoon, I assisted to the session “Changing the role of public health”. 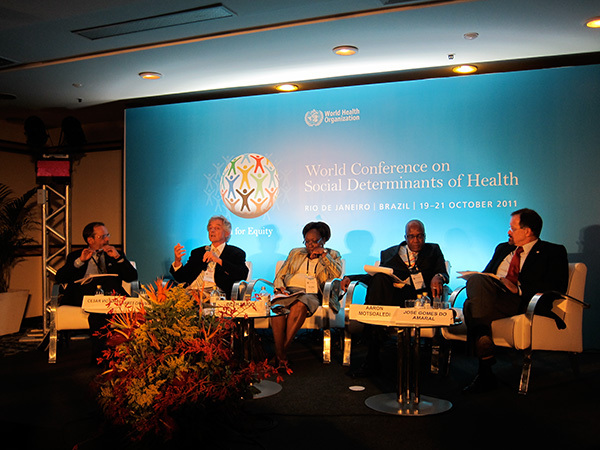 From left to right, Cesar Victoria (president of the International Epidemiological Association), James Chauvin (president-elect of the World Federation of Public Health Associations), Beth Mugo (minister of Public Health and Sanitation of Kenya), Aaron Motsoaledi (minister of Health of South Africa). Followed by discussion by José Gomes do Amaral (president-elect of the World Medical Association). Here, I also done an intervention introducing the World Health Professionals Alliance Noncommunicable Diseases toolkit. 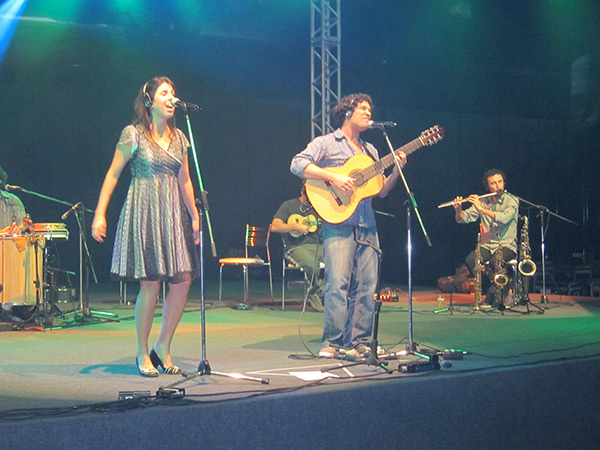 The Government of Brazil hosted a reception under the sound of Brazilian popular music. It was “Samba” time! Day three, High Level Roundtable on Social Determinants of Health and the Life Course. 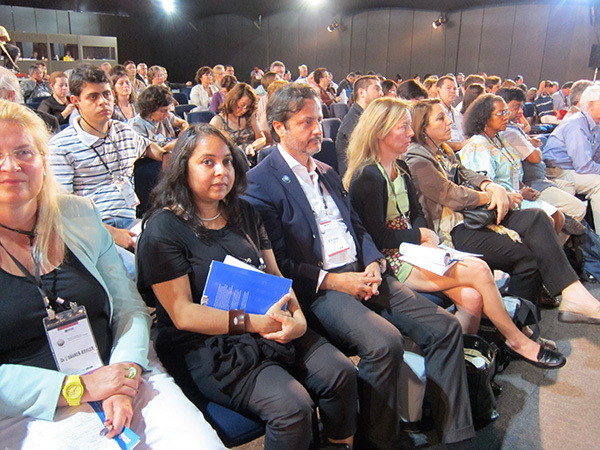 Opening statements by panelists and moderated roundtable discussion by Riz Khan, Al Jazeera English (at the photo). Participants: Marie-Paule Kieny (assistant director-general of Innovation, Information, Evidence and Research of WHO), Geeta Rao Gupta (deputy executive director of UNICEF), Purnima Mane (deputy executive director, assistant secretary-general of UNFPA), William Lacy Swing (director-general IOM), Assane Diop (executive director, Social Protection Sector, ILO) and Maria Guzenina-Richardson (minister of Health and Social Services of Finland). Assisting at the General Assembly of WHO on behalf of FDI. 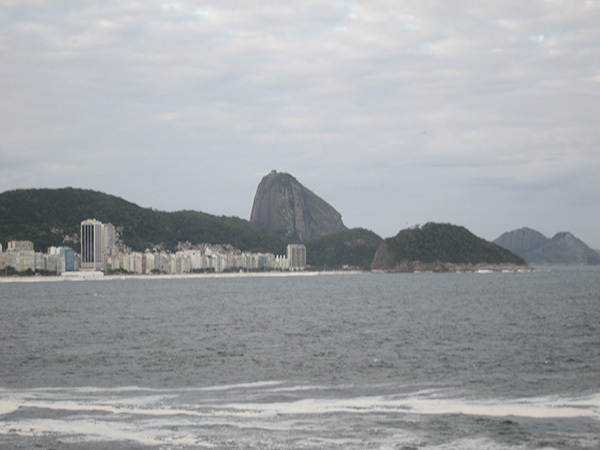 A view from Forte de Copacabana. 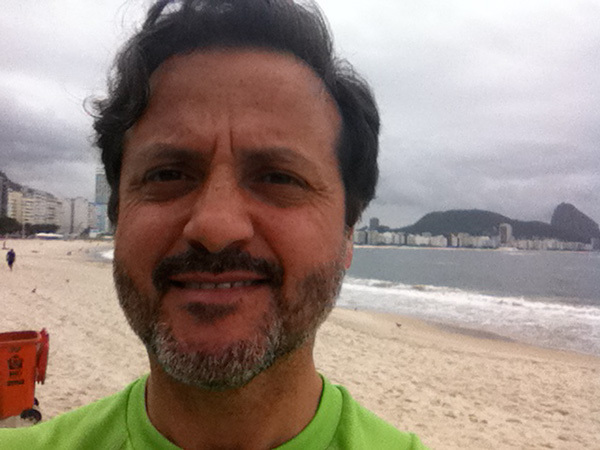 This entry was posted on Wednesday, October 26th, 2011 at 11:24 and is filed under Brazil, FDI World, World Health Organization. You can follow any responses to this entry through the RSS 2.0 feed. Both comments and pings are currently closed.